The sleek styling and performance of the Chevrolet Corvette and the Audi R8 have made them two of the most popular sports cars in the marketplace today. You may be considering both options. To compare them adequately, you need to understand their similarities, strengths and differences. Armed with this information, you will be better able to understand which vehicle fits your design tastes and performance preferences, as well as, your lifestyle. Regardless of your choice, both sports cars offer excellent examples of sleek styling paired with speed and unparalleled performance. Both the Corvette and the Audi R8 have the same number of seats. Drivers will appreciate the additional legroom in the Corvette. The added headroom also makes the Corvette feel more spacious. For everyday errands and storage, the cargo space in the Corvette is larger than the Audi R8. The narrower design of the Audi R8 makes it effortless to navigate the vehicle in city traffic. If is also shorter than the Corvette which may make it simpler to get into and out of tight parking spaces. This practicality can help you get more enjoyment out of everyday use of the vehicle. Both cars have similar fuel mileage numbers. The Audi R8 sees 14 mpg in the city and 22 mpg on the highway. The Corvette gets 13-16 mpg in the city and 19-25 on the highway. These figures most likely will not play a significant role in deciding between these two vehicles. When you are considering a sports car, the most important question is ‘what kind of power does it have?’. With 518 horsepower under the hood, the Audi R8 is one of the most robust engine’s available in a standard vehicle. The 5-liter total engine capacity and torque capability creates a standout sports car. With impressive power and speed, it can reach a top speed of approximately 200 miles an hour. Acceleration is also notable with the Audi R8 reaching 125 mph in about 8 seconds. The Corvette is equally, if not more, impressive. The 6.2-liter capacity supercharged engine means power. It also has about 640 horsepower. This not only makes the Corvette faster than the Audi, it has better acceleration. One element that contributes to the rapid acceleration is the Corvette’s plastic frame. As it is much lighter than comparable metal frame models, there isn’t as much weight to move so the engine’s power is translated into faster speeds. In terms of cost, the Corvette comes in with a MSRP of $55,900 – 125,400. The Audi R8 MSRP is $138,700 – 208,100. The price tag will stir interest in consumers looking to maximize their investment in a powerful sports car. It has also been suggested that the insurance premiums for the Corvette will be lower than those for the Audi though none of the experts have suggested a reason for this. While there are many factors to consider when comparing two performance sports cars, each potential buyer or admirer will have their own subjective opinions to add to the data. With add-ons, the Audi R8 makes up for some perceived deficiencies. Its design is sturdier than the Corvette. Also, cargo space can be increased with a shelf behind the seats. Whether these modifications will adequately negate consumer opinion about other facets of the vehicle is yet to be seen. With less torque and horsepower than the Corvette, the Audi R8 will not only be slower, it will also feel less powerful. Comparing the price tags will also give consumers some food for thought. At the end of the day, these are two powerhouse sports cars that turning heads. In a matchup between Europe’s finest and America’s sports car, we put the new generation of the Audi R8 against the 2016 Chevrolet Corvette. Let’s start talking about models. In terms of variety, the American brand takes the edge over the Audi R8. The Chevrolet Corvette is available in five different models: the Convertible Z06, the Coupe Z06, the Stingray Convertible, the Stingray Convertible Z51, the Stingray Coupe, and the Stingray Coupe Z51. All of these models also have alternatives among 1LT, 2LT, and 3LT. The R8 is also available in five different variants: the 4.2 FSI Quattro, the 5.2 FSI Quattro, the 5.2 V10 Plus Quattro, the Spyder 4.2 FSI Quattro, and the Spyder 5.2 FSI Quattro. Keeping pace with the fame that immortalized the two brands for their powerful engines and performance, the 2016 R8 and 2016 Corvette do not fall too far from the tree. The Corvette Stingray can pull off some astounding numbers when it comes to speed and acceleration. With its 455 horsepower V-8 engine, the Stingray can go from 0 to 60 mph in 3.7 seconds with the eight-speed automatic model. And, as amazing as that sounds, the Z06 model can still blow those numbers off the road, clocking from 0 to 60 in just 3.3 seconds in the manual transmission. The R8 models can hold their own in terms of acceleration against the Corvette, with the V10 Plus R8 clocking better times than the Z06. In the regular V10 models, the R8 can go from 0 to 60 mph in 3.4 seconds, while the V10 Plus model, which packs 610 horsepower, can make 0 to 60 in just 3.1 seconds. The R8 also has the edge in a quarter mile race, clocking at 11.2 seconds. 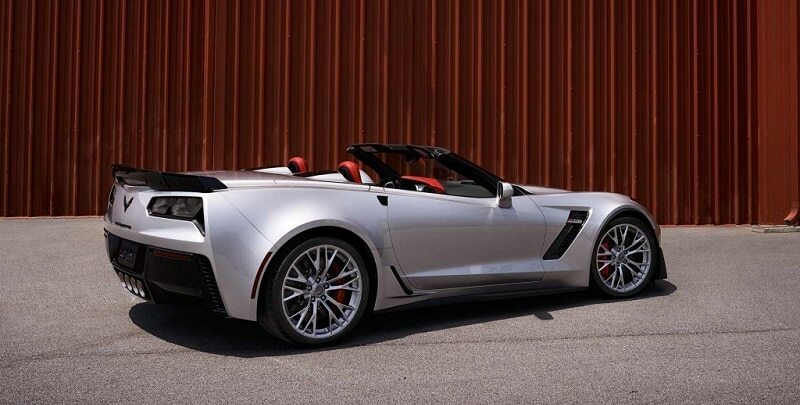 The Corvette Z06 Convertible finished a quarter mile in 11.3 seconds. The Corvette is also an excellent choice for speed fans looking to save on some gas mileage while having fun. In the 1LT Stingray variant, the Corvette shows an exceptional fuel economy ratio for a sports car, consuming an average of 17 mpg in the city, and 29 mpg while driving on the highway. Audi’s regular V10 model doesn’t compare to the Stingray but also has an excellent fuel economy ratio for a sports car. It consumes 16.7 liters per 100km (14 mpg) city driving, and 8.4 liters per 100km (28 mpg) on the highway. Nevertheless, the German brand has the edge over the American powerhouse when comparing the fuel economy between the two most powerful Corvette and R8 models. Audi’s most powerful car, the V10 Plus, consumes around 17.5 liters per 100 kilometers (roughly 13.5 mpg) driving in the city, and 9.3 liters per 100 kilometers (approximately 25 mpg). Chevrolet’s most powerful, the Corvette Z06 Convertible has an average consumption of 15 mpg in the city and 22 mpg on the highway. A customer favorite in the Audi R8 is certainly the Audi Virtual Cockpit, which will please even the most traditionalist drivers. Chevrolet preferred a more traditional and luxurious theme designing the new Corvette, which says speed even when it is parked in a garage.